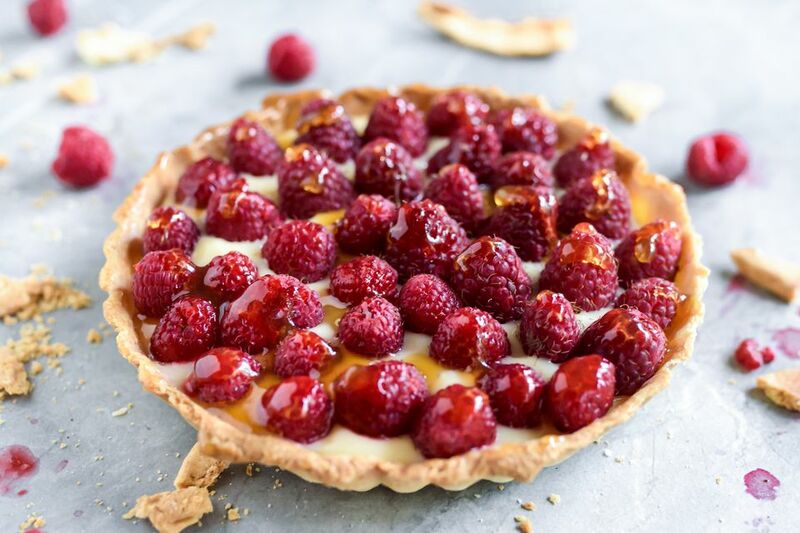 This tart features a sweet, crumbly crust filled with velvety smooth vanilla custard, all topped with ripe, juicy fruit for a refreshing treat. The tart pastry is the most time-consuming part of the recipe, but it's not overly complicated to make if you have the right tools and ingredients. Note: while there are multiple steps to this recipe, this vanilla custard fruit tart is broken down into workable categories to help you better plan for baking. Process the flour and butter in a food processor until coarse crumbs form. With the motor running, add the water, and lemon peel through the feed tube and process until the dough leaves the sides of the bowl. Gather the dough into a ball, flatten, wrap in waxed paper and refrigerate for 30 minutes. or just until firm enough to roll out. If not using immediately, wrap with plastic and refrigerate up to three days or freeze up to three months. Put the flour and butter into a medium bowl. Cut in the butter with a pastry blender or two knives until the mixture resembles coarse crumbs. Add the water, lemon peel, and lemon juice. Stir until the dough holds together. Press the tart dough evenly into the bottom and up the sides of a nine- or 10-inch tart pan with a removable bottom. Freeze for 20 to 30 minutes until very firm. Prick the bottom of the tart shell at one inch intervals with a fork. Bake 12 to 15 minutes until crust is set and just beginning to brown. Remove foil and bake until crust is golden brown, 10 to 12 minutes more. Set the crust on a wire rack and cool completely. Bring to a gentle boil over medium heat, and whisking constantly, boil for four to five minutes until the mixture thickens. Remove the pan from the heat. In a small bowl, whisk the egg yolks. Gradually whisk in about one cup of the hot-milk mixture. Pour the egg yolk mixture into the saucepan and, whisking constantly, simmer for 2 to 3 minutes until slightly thicker. Remove the pan from the heat. Add the butter and vanilla, and stir until the butter is melted. Strain the custard through a fine sieve set over a medium bowl. Place plastic wrap directly on the surface of the custard to keep a skin from forming. Refrigerate until cool, abut 1 hour. ​Stir the custard and spread into the prepared crust. Top with the fresh fruit. Brush the fruit with the preserves. Serve the tart right away or refrigerate up to 24 hours. To save a little time, you can opt to skip making the pastry from scratch and buy pre-made tarts or dessert shells, but make sure you read any instructions for preparation, especially if the tarts are frozen.